Optimae LifeServices operates three eight-bed residential care facilities in Story County and a specialized nursing home near Bloomfield, Iowa, that serves elderly with severe and persistent mental illness. It is one of only three such facilities in the state. 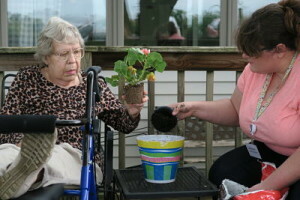 The residential care facilities in Story County offer people with mental illness and disabilities assistance with day-to-day living activities to help them succeed and, in some cases, transition out of the facility. Davis Center, located five miles East of Bloomfield at 22425 Overland Avenue, offers specialized care for individuals age 65 or older who have a primary mental health diagnosis and require nursing care. It has provided care for Iowa’s elderly since 1995, when it opened its doors as Iowa’s first intermediate care facility for seniors with mental illness. It has a five-star rating from the U.S. Centers for Medicare and Medicaid based on health inspections, quality of medical care and the time nurses spend with residents. U.S. News & World Report also named it among the top nursing homes in the U.S. in 2015. Davis Center sets itself apart with an experienced staff that specializes in mental health care and provides psychiatric interventions and assessments. It also provides direct contact with qualified mental health professionals and a psychiatrist who is on-call around the clock, a full-time social worker and a higher ratio of nursing staff to residents, with a qualified nurse on-site at all times.